BMW 6 Series Coupe revealed | What Car? 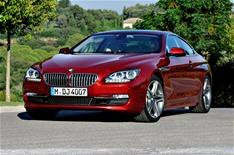 This is the new BMW 6-Series coupe, which arrives in the UK this summer. The car is likely to cost from around 58,000 and will be unveiled at the Shanghai motor show next month. Engine options from launch are a 316bhp 3.0-litre 640i and a 401bhp 4.4-litre V8 for the 650i. Both use an eight-speed automatic gearbox, while the 640i is also fitted with an engine stop-start system. The 640i blasts from 0-60mph in 5.4 seconds, does an average of 36.7mpg and emits 179g/km of CO2. The 650i does the sprint in 4.9 seconds, returns 27.2mpg and has emissions of 243g/km. Both have an electronically limited top speed of 155mph. Judging by the Convertible version of the car, the slightly lighter Coupe should prove very good. We gave the drop top four out of five stars when we drove it earlier this year. The production version of the Coupe follows on from the near-finished concept car that was shown at the Paris Motor Show last year and the four-door Gran Coupe design study. The four-door car is expected to go into production in 2012.